Submitted by witness on Tuesday, September 20, 2011. OBSERVED: I grew up in a very outdoor environment and spent a substantial amount of my time growing up in and around woods, day or night. I’ve lived in WA my whole life and had in interest in crypto-zoology as a child but had never taken any mention of Bigfoot seriously until I had my encounter. Having spent that night, like many before and after, relaxing on my friends patio with several other regulars, I got up, put out my cigarette, said my goodbyes and left. 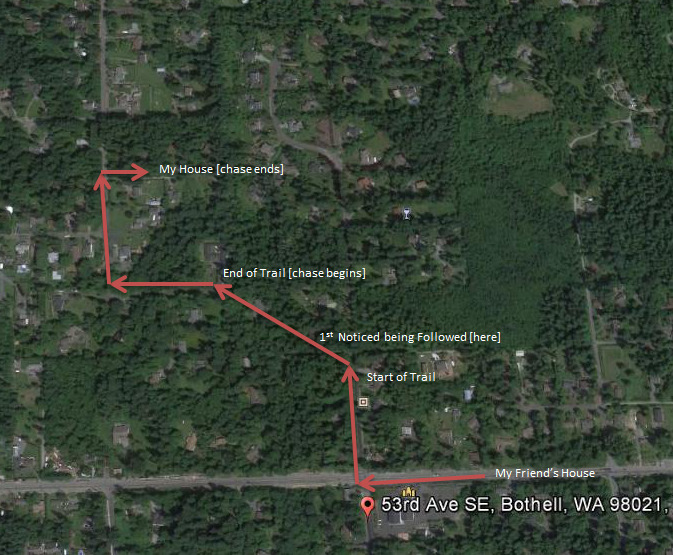 I walked out his driveway, took a left onto 228th, and walked towards 53rd. The night was moonless and so it was very dark; there were streetlights, but each of them was separated by 70-100ft or more and was only on one side of the road. It was probably around 1 in the morning, and it was normal for me to not see any cars on my short trip on the main road. Taking a right onto 53rd and then a left onto the trail most the way down it, I entered the trail. It was very, very still but the normal sounds were there for night time; some insects, the occasional rustle in the bushes of a smaller animal, nothing out of the ordinary. It was almost pitch black because of the tree cover, but I knew the trail like the back of my hand and walked confidently forward. Then it happened. Behind me to my right, probably about 20ft away, I heard movement in the brush and ferns. I didn’t even realizing I was hearing anything until it lasted more than a few seconds…and I realized it was moving in the same direction as me and breaking sizable tree branches underfoot. I stopped and listened. In a moment, the rustling came to a stop. I could hear faint, slow, deep breathing, like that of a large animal; it wasn’t loud enough to be from exertion, but seemed natural, as if whatever was behind the lung capacity was big enough to encompass several of my breaths in one of its own. I waited for about a minute and didn’t hear anything except the breathing, slow and even. I took another step and started down the trail again. And again, something moved through the woods after me, keeping pace and tempo with my movements. Sure enough I could hear ferns, ivy, blackberry bushes and the like being pulled or pushed aside, and that slow breathing started again. I stopped again, and this went on for another 5 or so minutes before I reached the trailhead, scared out of my wits. I still hadn’t heard any individual footsteps, hadn’t seen it or smelled anything; I don’t remember which way the wind was blowing, if there was one. I’d decided that once I hit the tree line, I’d make a run for it. So as I walked evenly up, followed in the same way I had been for several previous minutes, and trusting my years as a track runner (which I was fairly talented at), came to a stop and then bolted into a sprint down the hill. At moment later whatever was following me decided to move as well. As I pounded down the hill towards the right turn up 45th Ave, it too broke the trees from where I had, the gravel and then the asphalt. Its breathing became a series of low growls, almost a series of calls that sounded hoarse and aggressive. It was loud; loud enough to echo off the surrounding trees. But the moment it hit the gravel I knew something was wrong; of all the animals I’ve ever seen in their natural habitat that are native to western WA, none of them sounded like this one did. There was no lope, stride, or gallop that resembled how this thing sounded when it moved. One of the more intense memories of this incident was hearing that noise; distinctive impacts with the ground on not four, but two feet, and the smacking of bare feet on asphalt when it hit the driveway. That was quite unsettling, to say the least. But then another thing happened to my dismay and confusion; instead of following me down the driveway on the asphalt, it crossed back onto the asphalt and then into the woods to my right diagonally away from me. My first sensation was relief, until I realized it had increased its speed drastically, and its calls rang out from the woods in my direction still. Rounding the corner to go up 45th to get to the street level (and where there were streetlights), I realized it was trying to cut me off by getting ahead of me by cutting through the back yards of my neighbors across the street from me. Realizing this, I got a huge adrenaline rush as I absorbed the severity of having this thing, whatever it was, between my house and I. Running as fast as I could, I cleared the hill and started running on the flat towards my driveway off the road a little farther down. At the same time, behind me to my right, I heard this thing pound across a neighbor’s grass yard; heavy, distinct, single impacts of a two-legged animal. I’d been able to beat it to the road, but I wasn’t out of trouble yet. As I raced along the road it crossed their yard, leapt the 10ft ditch and landed 4 feet below on the asphalt road behind me all without stopping, tripping or stumbling once. It had kept on growling/calling at me, and guessing from the time it took for it to reach the road from their backyard I figure this thing couldn’t have been moving any slower than 20-25MPH; and I’ve been clocked at sprinting 22MPH before (not including adrenaline). As it pounded after me I heard once again the distinct sound of two individual feet contacting the ground. As I took a turn onto my driveway, my dog Gus, a purebred Airedale Terrier, started going off barking. I skidded around the corner, short (not including adrenaline). As it pounded after me I heard once again the distinct sound of two individual feet contacting the ground. As I took a turn onto my driveway, my dog Gus, a purebred Airedale Terrier, started going off barking. I skidded around the corner, shortly followed by my pursuer, and got to my house with Gus running up to meet me. He was in full sprint; legs outstretched, heckles up, growling fiercely (and he was a gentle giant, he only acted that way towards squirrels/coyotes/raccoons). He must’ve seen what was after me and it stopped him dead in his tracks; he went from a sprint to 0 in about 3-5ft and started barking extravagantly. I stopped as I heard whatever this creature was stop and wheeled around to look back for the 1st time. Away from the streetlights on a moonless night with old pine/fir trees looming overhead, my eyes couldn’t see a damn thing. But I did see the gravel it must’ve kicked up by coming to such a fast halt land near my feet and felt it bonce off my shoes and lower legs as I was turning around. The three of us were all frozen in place for a single, quiet moment. Gus was growling, hair raised, ready to defend me. I was panting, standing straight and looking straight into the darkness. And whatever this creature was couldn’t have been more than 15ft in front of me, growling and breathing deeply enough to raise the hair on the back of my neck again even after being chased the way I was. Gus and I looked at each other at the same time and I said “stay” with all the gravity I could muster in my voice. He looked back into the darkness and continued growling as I dashed the garage, grabbed a hatchet and ran back. I returned to the same scene; Gus and this thing having a growl-off. I unsheathed the hatchet and stood ready, waiting, searching the blackness or any sign of this thing. But all I could hear was its breathing and the intense sensation that we were making eye contact; that this thing and I were holding each other with our eyes for several minutes. Then suddenly I heard crashing and rustling in the bushes moving away from me for a good 30 seconds, and Gus relaxed. We both went inside and I didn’t let him out at night for a week after that; after dark he’d sit by the windows and occasionally growl as if he’d seen something. He didn’t even do that to any of the other animals he’d normally go Terrier on. And each time he did I’d step outside and listen, and the woods would be filled with an unnatural quietness, or stillness. Since that night I can confidently say that I was stalked, followed, and then chased by a Bigfoot, that then was dissuaded by the presence of my dog and the light of the house so near. ALSO NOTICED: For several weeks (before and after this event) several of the friends who's house I'd been at and I had all heard strange movement in the woods just outside of the light at night circling his house. OTHER STORIES: I had a childhood friend who told me that within a mile of my parent's house was a teepee he'd found (when he was a kid) in the woods made of different kinds of tree branches and surrounded by scattered animal bones. He said it was strangely silent when he was there. I spoke with the witness by phone and he recalled every detail from memory without being prompted. He was very articulate and credible as he recounted his story and how he felt during this very intense encounter in the Canyon Park area near the city of Woodinville. • At the end of the chase he estimated the creature was standing only five or six feet away. • The creature was in the shadows and couldn’t be seen, but its breath could be seen, silhouetted in the chilly night air against the faint light from a neighbor’s porch light. • The creature was exhaling at a height just above the six foot height of the witness. • The creature smelled “incredibly bad”. • The witness felt that the creature was looking directly at his eyes, although he could not see the creature. • The witness did not feel threatened, but was still very shaken by the event. • During the week leading up to this encounter, a “multi-chorus of howling” was often heard around the friend’s house at night, with green eye-shine being seen at a height of four to five feet off of the ground. The eyes were about four inches apart. The witness and his friend would occasionally run at the location of the eyes, chasing them into the brush away from them. See the picture below for a diagram of the events. At the time of this encounter the location was semi-rural and near a greenbelt that eventually leads to the foothills of the Cascade Mountains. Many houses have since been built in the area and the greenbelt has been reduced. But there are still plenty of wooded areas left that would allow such a large creature to pass through without being seen. The facts of this encounter appear to indicate that the witness was raced/chased by an intelligent creature that is not only curious but also has a somewhat competitive, yet non-aggressive attitude.